we became celebrities at the festival yesterday. we got there around 1 maybe, thinking the festivities would be in full effect, it being saturday and all. the place was a ghost town so certainly everyone was at the fair… nope. stuff wasn´t going to really get going till 7 or so. (it´s still a mystery… where were the people in town?!) we played cards and walked around till it started to look like rain. we were headed back to the center of town to find a cafe when the sky opened up so we wandered back to the fair. found a spot with some cover and ordered a 7UP. soon we were surrounded by a camera crew who wanted us to tell everyone why we were here and what we thought about the asado! afterward we were given the royal treatment, best seats, beer, first tastes from the grill. yes. i did try the bbq. it was quite good. and the whole process was intense. 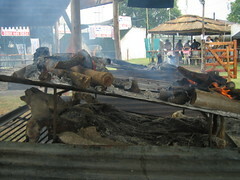 you have to understand that the asado is THE soul of argentina. it was taken very seriously. they eat everything. tail. head… everything. we were serenaded by gauchos who sang with such fervor, the essence of being a gaucho. they passed us maté while someone explained to us their attire. we couldn´t stay late unfortunately cause the last bus home was at 11, but before we left our presence was made known to everyone by the MC on stage who insisted we stand and be applauded. we were overwhelmed by everyone´s generosity and interest in us. a totally unpredictable day that will forever crack me up. This entry was posted in rambling.... Bookmark the permalink. Erica! Hey sounds like the festival was a blast! Miss you girl- hope you had a great birthday and Thanksgiving!!! The festival sounds awesome! Glad you guys got to experience it! Also I was just looking through your pictures and those empanadas you made look out of this world!! Do you have a receipe you can share? mmm….I”m hungry! convencion de malabres! the best of times..